If you build an EMR app for the iPad, will they come? Maybe, if doctors can be convinced that the technology is secure and able to carry out the sometimes complex tasks associated with managing patient care. According to a 2012 survey, most doctors would like to use a mobile device like a Smartphone or tablet to access their patients' medical records. They use these devices to manage their other professional and personal activities, so why not use one during direct patient care? Even so, of the 240 physicians surveyed, only 6 percent said they actually used a mobile application to access electronic medical records. But the overwhelming majority - 91 percent - said they would like to have a mobile electronic health record solution for clinic use or during hospital rounds. So what's the problem? Why don't more doctors access their patients' medical data using an iPad or similar tablet? The answer is simple. Most doctors don't believe the iPad can effectively handle a complex clinical application like an electronic medical record. That's proven by another 2012 survey conducted by Spyglass Consulting Group. In it, 80 percent of "early adopter" physicians said the iPad wasn't yet ready for clinical use. Pair that belief with a reluctance among hospital information technology departments to support tablet technology, and you can understand why more docs don't use iPads to e-prescribe, review and update charts, view clinical data or send secure notes. Is security really a concern? Security is at the core of both doctors' and organizational entities' concerns. With an ever-present focus on HIPAA and patient privacy, there's a widespread belief that iPads can't provide a secure enough portal for sensitive health information. But with advances in iPad-native EMR software, security should no longer be considered an issue. With more and more software companies developing HIPAA-compliant technology expressly for the iPad, doctors can feel secure using tablet to manage their patients' health record. 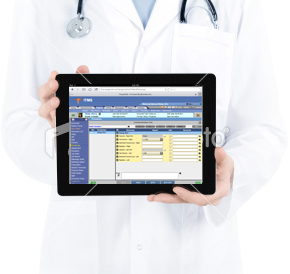 RevenueXL's PrognoCIS Electronic Records' iPad application offers doctors best-in-class security along with many of the same features available on the desktop EMR version. The iPad application includes menu options such as charting growth, transcribing notes, sending reports and messages, accessing clinic forms and entering orders. These features make possible for doctors to make their EMR portable and carry out daily transactions and make updates conveniently. Unlike some of the major players in the EMR marketplace, PrognoCIS EMR offers iPad-specific technology that compliments the desktop version. And why not? Medical practices of all sizes are upgrading their electronic medical record and practice management systems to meet CMS's meaningful use initiative. That's why it makes sense to give them tools that makes day-to-day operations and patient care flow much more smoothly. RevenueXL's PrognoCIS EMR offers an effective solution for virtually any type of medical practice, The software offers specialized features and templates to accommodate various medical specialties, from family medicine to cardiology to endocrinology to obstetrics and gynecology. Billing and communication with practice staff members and physicians at other medical facilities also get more efficient with the PrognoCIS EMR. To learn more about how the PrognoCIS EMR and its complimentary iPad application can help improve operations at your medical practice, please request a complimentary demonstration or call 888-461-9998 to speak with a knowledgeable professional. Web Based EMR or ASP based EMR - No Need to Get Confused!